Ok, I have a king and a pawn, on the far right of board, the pawn is two moves away from queendom, on the very far right however the opponents king is in right corner ahead of pawn. Is there any way to avoid stalemate? There are no other pieces on board, just my king, one rooks pawn, in column 6, and there king in rooks starting positon ahead of pawn? I have created a diagram. See below. This is a fundamental endgame and every chess player should know it. If it is White's move he will win because after 1. h7 the pawn will promote into a queen. 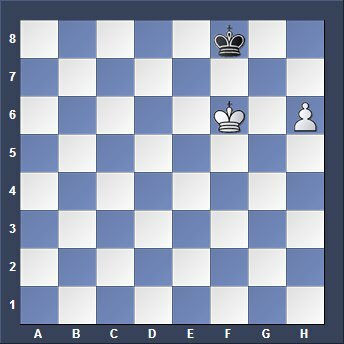 If it is Blacks move then after 1...Kg8 the king is permanently blocking the pawn and stops pawn promotion. The position will finally end in a stalemate. There is no way around it. When you have a rook pawn and a king then make sure that the opponents king cannot reach the corner. To stop him you have to advance your king first and fight for space to keep the opponents king away from the corner. When this can't be done and the opponents king reaches the corner then the game is a draw because stalemate cannot be avoided.